The work of The Planning Practice is translating insights about people, products, and brands into profitable marketing strategies. We’ve had a 20-year-long conversation with consumers, always finding new and better ways to include their voice in the creation of brands people want to associate with, advertising people want to engage and interact with, and innovative products people want to buy. 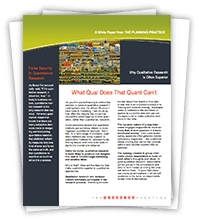 Our most recent white paper: "What Qual Does that Quant Can't."